Dutch designer Jeroen van Laarhoven has created a collection of conjoined chairs. 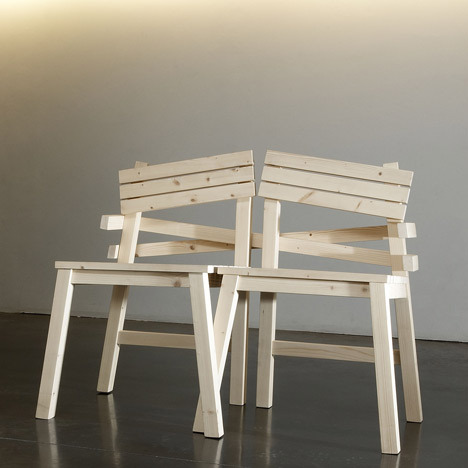 Called LAT - Love.Approach.Together - the seats are connected together in twos or threes by criss-cross wooden elements on the back. The inside legs of the chairs are also crossed and joined together. Photographs are by Isabel Rottiers. The concept of the LAT chair is about the loving embrace between two chairs, falling into each other as a reaction to a fragmented reality. A universal feeling that easily transmits to people, who are then free to interpret it in a personal key. These days we are using a lot of technological media’s to communicate with each other (mobile phones, mobile internet, social network programs etc). We use al lot of these technologies to show that we care about somebody. To stay connected with each other. But still there is a virtual distance: A personal distance. The LAT chair is designed to bring people closer to each other. To expresses the feeling that we really care about somebody in a personal way. From young to old, connected in a personal and human way. Embrace each other, embrace to be real connected! The LAT chair is also designed in a triple version, as single chairs, in soft versions with cushions (the cushions are optional in different colour options). These designs still have the same design language and translate the same (human) embracing/connected feeling.